All Black scrum-half Byron Kelleher played for Otago in the NPC and then Highlanders in the Super 14 before heading north in 2004 to sign for Waikato and the Chiefs. The combative scrum-half enjoyed a decorated career with the All Blacks, making his debut in 1999 against Samoa before scoring his first-try for his country four games later against Tonga. After featuring in the 1999 World Cup, Kelleher went on to appear in two further tournaments, in 2003 and 2007. Following the 2007 World Cup Kelleher was due to play for Agen but due to the side being relegated to Pro D2, his contract was cancelled. 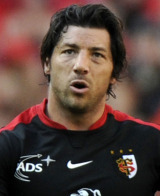 He instead signed for Top 14 side Toulouse and enjoyed four seasons with the French champions, notably taking the 2008 domestic title and 2010 Heineken Cup. Despite signing a pre-contract agreement with Bayonne for the 2011-12 season, Kelleher and the club mutually agreed to rip up this agreement. In June, Stade Francais announced Kelleher as their new scrum-half.